Nv4_disp.dll is used by Nvidia graphics card drivers to maximise the performance of your Nvidia components. 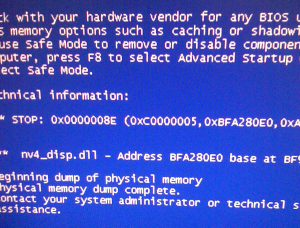 In Feb 2010, Nvidia released an update that caused some users to experience this particular file to enter into an infinate loop, and the blue screen of death error. Nvidia itself has not released a fix for this, however, many users have collaborated to produce a fix that can fix it. This error will usually result in a blue screen appearing with the error message containing the value “Nv4_disp.dll” somewhere. The reason why a blue screen shows is because the error will prevent Windows from being able to use the NVidia graphics adapter that you have on your PC. The specific error is caused when the driver & hardware of your PC cause a conflict, leading the driver to continually run in a loop over-and-over again. This “infinite” loop causes Windows to become unusable, triggering the blue screen error. Although the NV4_Disp.dll error has not been officially fixed by Nvidia, it has been experienced by many users, that the community has developed a fix that you can apply to prevent this error occurring. There are also other ways in which to solve this problem, one would be to use the latest drivers; manually replace the Nv4_disp.dll file or clean out the registry with a registry cleaner. Please Note: From the website you must pick your graphics card model and operating system. It is important you pick the correct details as the drivers on the website are designed for specific setups.